Adam Michnik (Polish pronunciation: [ˈadam ˈmixɲik]; born 17 October 1946) is a Polish historian, essayist, former dissident, public intellectual, and the editor-in-chief of Poland's largest newspaper Gazeta Wyborcza. Brought up in a family of committed communists, Michnik became an opponent of the communist regime at the time of the anti-Jewish purges in the party. He was imprisoned, first, after the 1968 March Events, then, after the imposition of the Martial Law in 1981. Michnik also played a crucial role during the Polish Round Table Talks, as a result of which the communists conceded to call elections, which were subsequently won by Solidarity. Even though he has withdrawn from active politics he has "maintained an influential voice through journalism". He is a laureate of many awards and honors, including a Knight of the Legion of Honour and European of the Year. 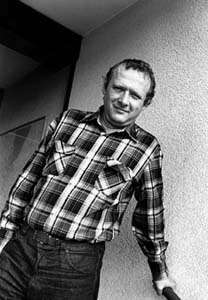 Adam Michnik was born in Warsaw, Poland, to a family of Jewish communists. His father Ozjasz Szechter was First Secretary of the Communist Party of Western Ukraine, and his mother Helena Michnik was a historian, communist activist, and children's-book author. His step-brother on his mother's side, Stefan Michnik, was a communist judge in the 1950s, during the Stalinist period, and passed death sentences on Polish resistance-movement soldiers. His step-brother on his father's side, Jerzy Michnik (born 1929), settled in Israel after 1957 and then moved to New York. While attending primary school, he was an active member of the Polish Scouting Association (ZHP), in a troop which was led by Jacek Kuroń. During secondary school, this particular Scouting troop was banned, and Adam began to participate in meetings of the Klub Krzywego Koła (Club of the Crooked Circle). After its closing in 1962, with the encouragement from Jan Józef Lipski and under Adam Schaff's protection, he founded a discussion group, "Contradiction Hunters Club" (Klub Poszukiwaczy Sprzeczności) and became associated with the left wing student opposition group, the Komandosi. In 1964 he began studies in history at Warsaw University. A year later he was suspended because he disseminated an open letter to the members of Polish United Workers' Party (PZPR) among his school mates. Its authors, Jacek Kuroń and Karol Modzelewski appealed for a beginning of reforms which would repair the political system in Poland. In 1965, the PZPR forbade his texts to be printed. In 1966 he was suspended for the second time for organizing a discussion meeting with Leszek Kołakowski, who was expelled from the PZPR several weeks earlier, for criticizing its leaders. From then on he wrote under a pseudonym to several newspapers including: “Życie Gospodarcze”, Więź”, “Literatura”. Władysław Gomułka used Michnik's Jewish background to wage an anti-Semitic campaign, blaming the Jews for the crisis. Michnik was arrested and sentenced to three years imprisonment for "acts of hooliganism". Between 12 April and 27 June 1990 Michnik, together with Bogdan Kroll – director of the central archive Archiwum Akt Nowych, and historians Andrzej Ajnenkiel and Jerzy Holzer, had access to the archives of the Polish Ministry of Internal Affairs (MSW). This group was called "Michnik's Committee" and was brought into being by an initiative of the historian Henryk Samsonowicz. The result of three months' work was a short official report which stated that the archives are incomplete. Prime Minister Tadeusz Mazowiecki in his expose in September 1989 used a term broad-stroke policy which began new so-called broad-stroke attitude to political history of the most recent past. He is proponent and advocate of this term. In Gazeta Wyborcza he used his personal influence to protect General Wojciech Jaruzelski and General Czesław Kiszczak from being prosecuted for various crimes committed by Jaruzelski and Kiszczak during their time running the People's Republic of Poland (PRL). He gave an interview arguing the same which was published under the title "Pożegnanie z bronią. Adam Michnik- Czesław Kiszczak." by Agnieszka Kublik and Monika Olejnik which was published in Gazeta Wyborcza on 3 February 2001. Professor of Kiev-Mohylan Academy; 1 September 2006. 1 2 Pacholczykowa, Alicja (2010–2011). "Ozjasz Szechter". Polski Słownik Biograficzny. 47. Polska Akademia Nauk & Polska Akademia Umiejętności. p. 585. ↑ "Adam Michnik: to aksamitna droga do dyktatury". Onet.pl (in Polish). 25 May 2015. ↑ Paul Wilson, "Adam Michnik: A Hero of Our Time," The New York Review of Books, vol. LXII, no. 6 (April 2, 2015), p. 74.